On Thursday, the Consumer Financial Protection Bureau unveiled the student loan Payback Playbook, a set of prototype disclosures that outline a path to affordable payments for borrowers trying to avoid student debt distress. The Payback Playbook provides borrowers with personalized information about their repayment options from loan servicers so they can secure a monthly payment they can afford. 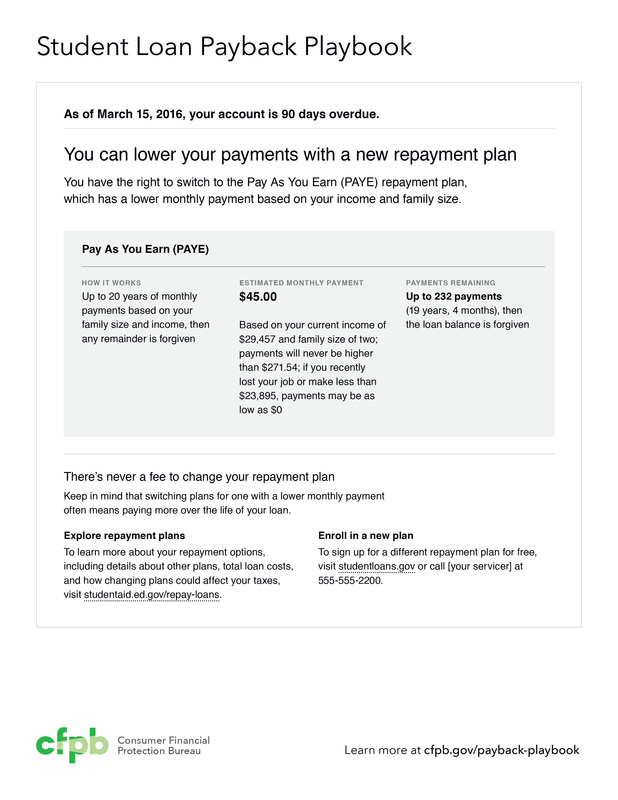 The Payback Playbook would be available to borrowers on their monthly bills, in regular email communications from their student loan servicers, or when they log into their student loan accounts. View the Payback Playbook prototypes. About 43 million Americans owe student loan debt, with outstanding debt estimated at $1.3 trillion. The Department of Education offers numerous plans to borrowers with federal student loans that help make payments more affordable. These include options that let borrowers set their monthly payment based on their income. Repayment plan options for federal loans have expanded in recent years, but record numbers of student borrowers continue to struggle with debt. One out of four student loan borrowers are currently in default or scrambling to stay current on their loans, despite the availability of income-driven repayment options for the vast majority of borrowers. According to a government audit, 70 percent of federal Direct Loan borrowers in default earned incomes low enough to qualify for reduced monthly payment under an income-driven repayment plan. These findings and the continued problems reported by student loan borrowers raise serious concerns that millions of consumers may not be receiving important information about repayment options or may encounter breakdowns when attempting to enroll. Personalized payment options: The Payback Playbook would require servicers to provide personalized information tailored to borrowers’ specific circumstances that show what their payments will be under different repayment plans. This information would include the number of payments over the life of the loan, monthly payment amounts, and whether payments will change over time. 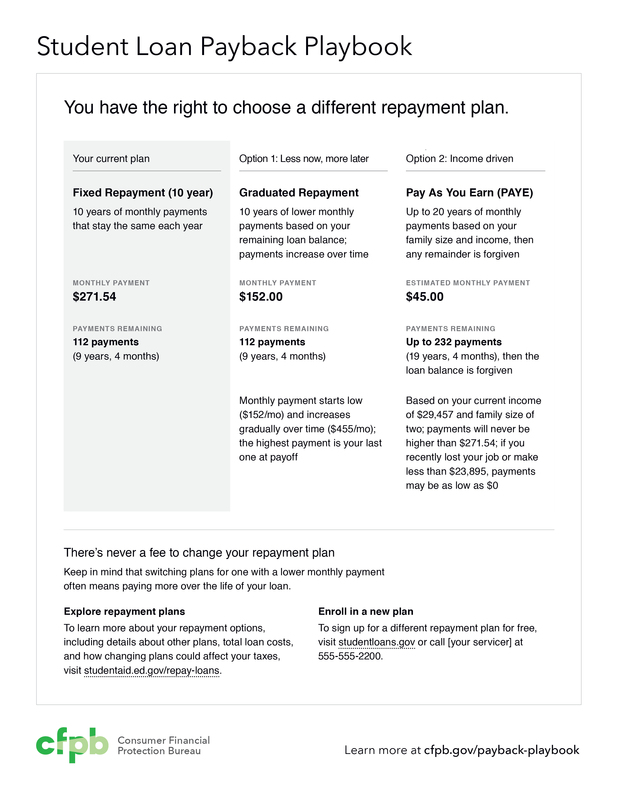 No fine print: The Payback Playbook describes each option using clear, straightforward language that makes it easier for borrowers to understand the different plans, pick one that fits their financial situation, and stay on track. Real-time, up-to-date information: The Payback Playbook provides borrowers with updated information when their plans or circumstances change so they can keep on top of their payments. This includes how much longer they need to make payments until their loan is paid off or forgiven. The Payback Playbook is available online and the public can provide feedback on these prototype disclosures through June 12, 2016. In the coming months, the Department of Education plans to finalize these disclosures, informed by the public feedback shared with the Bureau, to ensure that student loan servicers provide the information borrowers need to obtain monthly payments they can afford. The Department of Education, working with the CFPB, plans to finalize and implement these disclosures as part of the new vision for serving student loan borrowers announced earlier this month. Read more about this announcement on the CFPB website.